We don’t usually think about it, but most of how a relatively free society functions is through unwritten rules. The law is only capable of insuring consequences for a tiny fraction of bad behavior, so our civilization as a whole is pretty much responsible for maintaining social standards the rest of time. In politics, much of the enforcement of these unwritten rules has always been largely through self-policing. If someone was caught in a scandal, even if maybe the evidence against them wasn’t necessarily air-tight, or the violation really all that horrible, they were expected to do the right thing and resign their position, or drop out of a race (Gary Hart leaving the 1988 presidential race under circumstances so beatable that they would make Donald Trump giggle out loud today, immediately comes to mind). If a politician didn’t take the first hints from their own political party, the idea of co-existing with a bunch of people who would ostracize you for your transgressions was too much to bear and the second hint was usually enough to do the trick. No one (not even Richard Nixon) ever dared to challenge these unwritten rules and actually test their validity by fighting all the way to death, until Bill Clinton had an affair with an intern in the Oval Office, obstructed justice, perjured himself, and still refused to give in. Clinton ignored all the previous standards, fought through impeachment, and he somehow won. Since then, trying to predict how political scandals will play out has become a much more perilous business. This leads me to the Roy Moore situation. Moore, the Republican candidate for U.S. Senate in Alabama’s upcoming special election, was already an embarrassment to his party and his state even before yesterday’s bombshell that he allegedly had inapproriate contact with a 14-year old girl, and three other teenagers, when he was in his early thirties. Moore has shown absolutely no sign that he is going to withdraw from the race, or even back down an inch. He is even raising money from the controversy by trying to portray the story as the forces of evil out to get a good man who is just trying to save the country. Amazingly, he is getting lots of public support from the people closest to him who might actually have the influence to force him out. At least two high-profile Alabama Republicans have come out with bizarre defenses of Moore, including one comparing him to the father of Jesus (wait, my Catholic school upbringing taught me that Joseph never came close to touching the Virgin Mary sexually). Breitbart head Steve Bannon, the man most responsible for Moore winning the GOP primary over an incumbent senator, and the person with possibly the most to lose if Moore goes down in flames, is absurdly blaming the story on the Washington Post. Moore himself has coopted Trump’s “Fake News!” mantra in his attempt to distract from the substance of the damaging stories. At Fox News, the reaction has been mixed. Sean Hannity of course robotically defended Moore (and then tried to deny it), even shockingly dismissing the allegations because the interactions were supposedly “consensual.” Tucker Carlson at least had the good sense to effectively pretend that the story didn’t even exist (a tactic with which Fox News hosts are getting quite familiar lately). While Jessie Watters seemingly forgot that in the era of Trump there are no longer any set standards or rules, and appeared to get lulled into thinking this was still the 20th century. Sadly, unless something else happens to change the current course of events, Watters is wrong and Moore very likely will still, somehow, be elected a U.S. Senator. While it is possible he could lose a very tight race to the Democrat, I don’t see him dropping out and, as insane as it sounds, he will remain favored to win. 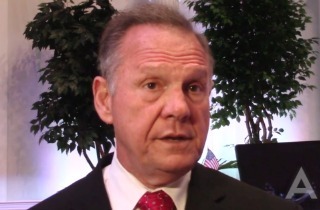 Let’s face it, the voters of Alabama already knew that Moore was both nuts and corrupt. The majority of them didn’t care. The foundation has already been set, mostly by Trump and the Access Hollywood tape, that a left-wing media hit piece, about old allegations, perfectly timed to inflict maximum political damage, will simply not be trusted among the conservative base, and it may actually energize his core supporters. After all, they have to keep the devil from doing his work through the election of one them-there liberal, colored-people-loving Democrats (if you think I am kidding, you need to understand that I have spent time in Alabama). Because election laws seem to make it impossible for another Republican to replace Moore at this late date and win the race, conservatives in Alabama will have another classic “binary” choice. The Trump precedent shows that if the Democrat is hated enough, Republicans will put up with literally anything and still stand by their man. About the only factor which makes me think Moore might still be doomed here is that it is quickly becoming “conventional wisdom” that he is a near lock to prevail, or even get promoted. After all, while a lot of the old political rules are quickly dying, the one about the conventional wisdom usually being wrong, is still very much alive.